Fill the radiator with clean, soft water. Put gasoline in the tank. Supply all parts requiring lubrication with oil or lubricant. Adjust the rear view mirror to correct position for driver. If adequate view is not obtainable, the mirror may be adjusted by loosening the screw through the mounting bracket or by tilting in the ball and socket connection. The position of all controls and switches is shown in Fig. 1. The horn is operated by pressing the button located at the top center of the steering wheel. The instrument panel light switch is located along the lower edge of the instrument panel to the left of the steering post. 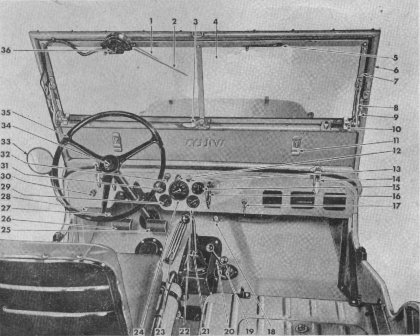 The windshield wiper control is mounted on the wiper motor housing. The main light switch No. 30 controlling both the head and tail lamps is conveniently located on the instrument panel to the left of the steering post. It is of the plunger type – pull all the way out for the “full on” position, half-way for “parking” and all the way in is the “off” position. In addition to the main light switch, the high and low beams of the headlamps are controlled by a selector foot switch, located on the toe board to the left of the clutch pedal. Pressing and releasing the switch button, with the foot, alternately changes the beam from high to low and vice versa. Put the transmission gearshift lever No. 21, Fig. 1 in neutral. Place the transfer case low and high shift lever No. 19 in direct gear or in the rear position and disengage the front axle by placing the shift lever No. 29 in the forward position. Pull the choke control button No. 13 one-fourth of the way out which also opens the throttle slightly. Place the key in ignition lock No. 17 and turn it to the right, closing the ignition circuit. Depress the foot starting switch at No. 18. Should the engine fail to start at once, pull the choke all the way out and press the starting switch. When the engine starts, push the choke in about one-third of the way. Set the choke control at the best operating position and as the engine warms up, push the choke all the way in. Do not run with the choke out as fuel is wasted and the engine fouled. Should the engine fail to start, see the “Emergency Chart”. Release hand brake, if set. Depress the foot accelerator pedal gradually and at the same time, slowly release the clutch pedal. Allow the vehicle to gain momentum (two or three vehicle lengths), then release the accelerator and depress the clutch at the same moment. Move the shift lever promptly to the second speed position. Shift to third or "high" speed in the same way at approximately 18 to 20 mph, releasing the accelerator and depressing the clutch before moving the shift lever. The synchronizing mechanism in the transmission makes gear shifting silent and easy. This device adjusts the speeds of the two gears to be engaged and prevents "clashing". TO CHANGE TO LOWER SPEED. Move the gearshift lever quickly to the next lower speed, increasing the engine speed slightly, if traveling on level road and release the clutch pedal. It will be found advisable to make this change when the engine is placed under heavy pull, or when dropping down to a very low speed, as when travelling up a steep grade, in sand or in congested traffic. Never attempt to make the change with the vehicle traveling at a high rate of speed. Depress the clutch pedal and apply foot brake. When stopped, move gearshift lever into neutral. Set the hand brake and release the clutch and brake pedals. With the vehicle at a standstill, depress the clutch pedal. Shift the lever into the reverse position, slowly release the clutch pedal and regulate the car speed with the foot accelerator. TO USE THE ENGINE AS A BRAKE. The most effective brake for holding the vehicle back on a steep grade is the engine. To use the engine as a brake, shift into one of the lower speeds before starting to descend. Keep the clutch engaged, the throttle closed, and the ignition “ON”. Low gear will hold any vehicle effectively on any hill it can climb. Never engage the clutch suddenly when the vehicle is coasting with the clutch released and the transmission gears in mesh, as damage to the driving mechanism may result. SHIFTING GEAR IN TRANSFER CASE. 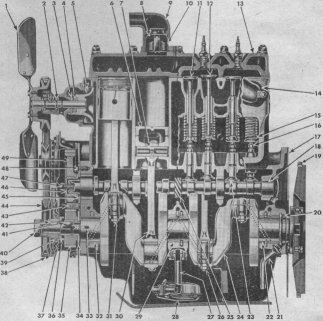 The transfer case is essentially a two speed transmission, which provides a low and a direct gear and also a means of connecting the engine power to the front axle. It is an auxiliary unit attached to the rear of the standard transmission. Control of the transfer case is through the two shift levers, Fig. 1 No. 19 and No. 20. The left lever, No. 20, is used to connect and disconnect the power to the front axle. The right lever, No. 19 is used to shift the transfer case gears to secure either “High” (direct drive) or a very low gear ratio for heavy pulling requirements. 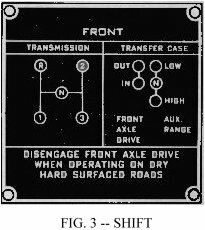 Instructions for shifting gears in the transfer case are as follows: See Fig. 3. 2. With the front axle drive engaged, the right hand lever (No. 19) may be shifted to the rear into “High” (direct) or forward into “Low”. The “Neutral” position midway between “High” and “Low” is for use when the power take-off belt drive is used. The vehicle cannot be driven when this lever is in “Neutral”. 3. To disengage the front axle drive, depress the clutch pedal, release the accelerator and shift the left lever to the forward position. The transfer case can be operated only in “High” (direct drive) when the front axle drive is disengaged. 4. Shifting from high to low transfer case gear should not be attempted except when the vehicle is practically at a standstill. The front axle drive must be engaged for this shift. Release the accelerator and depress the clutch pedal – move the left hand shift lever to the rear position to engage the front wheel drive, then move the right hand shift lever to forward position (low transfer case gear). 5. Shifting from low to high transfer case gear may be accomplished at any time, regardless of vehicle speed. Release accelerator and depress clutch pedal and shift right hand lever into rear position. USE OF FOUR WHEEL DRIVE. The “Universal Jeep” is equipped with four-wheel drive and transfer case to provide additional traction and a low gear ratio for use on difficult terrain and to provide low speed pulling power for industrial and agricultural use. Four-wheel drive should be used only when greater traction and power are required than provided by the standard transmission and low gear. Avoid the use of four-wheel drive on hard surfaced highways as it will result in rapid tire wear and hard shifting of the transfer case gears. Should hard shifting occur, disengage the clutch, start engine, shift the transmission into reverse gear, back the vehicle a few feet, and disengage the clutch. If transfer case is in low range, shift into high, then disengage front axle drive (left lever forward). 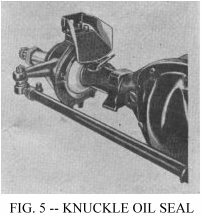 When parking during cold, wet weather, swing the front wheels from right to left to wipe away moisture adhering to the front axle universal joint housings and oil seals, Fig. 5. This will prevent freezing with resulting damage to the oil seal felts. When the vehicle is stored for any period, the front axle universal joint housings should be coated with light grease to prevent rusting. 1. In cold weather economical starting of the engine is easily obtained by pressing down on the accelerator pedal once or twice, then push down on the clutch pedal and start engine using the choke sparingly. Do not use the choke when starting a warm engine. 2. Do not use the choke excessively while engine is warming up and never leave it out longer than absolutely necessary. 3. Accelerate gently. Tramping on the accelerator pumps more gasoline into the cylenders than can be effectively used. 4. Holding the car in second gear until you get up to high speeds may easily double the gasoline you should use in getting under way. Shift into high gear at about 20 miles per hour. 5. Fast driving uses up more gasoline. Travel at moderate speeds if you want gasoline economy. 6. Decelerate to a gradual stop. Sudden stops, like sudden starts, are wasteful of gasoline. 7. Park your car in the shade if possible, hot sun evaporates gasoline. 8. Don't drive your tires with less than the proper amount of air pressure. Under-inflated tires mean more road friction, more work for the engine to do -- and therefore more gasoline consumed. See "Tire Pressure". 9. Keep the battery charged up in good condition. It helps starting and provides good ignition thereby reducing loss of gasoline. 10. Letting the engine idle for long periods wastes gasoline. 11. 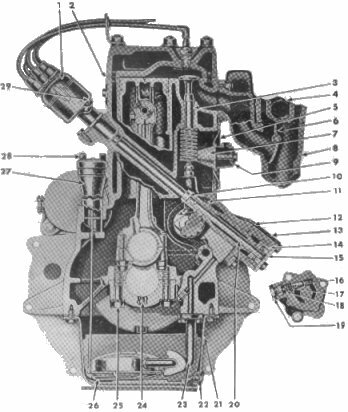 Be sure that the carburetor is in proper condition for maximum mileage and power. 12. One faulty or dirty spark plug may waste as much as 10 percent of your gasoline. Have the spark plugs tested occasionally. 13. Keep your car well lubricated at all times, and be very careful to follow the instructions on "Lubrication". 14. Keep the radiator filled to the proper level; your engine will remain at a more constant temperature. An overheated engine uses more gasoline. 15. Check the operation of the automatic heat control on the exhaust manifold. The purpose of this heater is to warm the mixture of air and gasoline as it leaves the carburetor, in order to give better vaporization. (See Manifold Heat Control). 16. It is a good idea to have a complete engine tune-up every 5,000 miles, or at least twice a year -- in the Fall when preparing for Winter driving and again in the Spring. The Owner Service Policy entitles you to an adjustment and complete inspection without charge at the end of the first 1000 miles.